The US Department of Justice is currently investigating the use of Tether on Bitfinex to manipulate the price of Bitcoin. The most recent slip that Bitcoin experienced in its price was so dramatic that it started a wave of accusations in all directions and even a criminal probe by the United States Department of Justice. Sources within the DoJ are looking into Tether and Bitfinex with the suspicion that the two companies behind these entities have been involved in illegally shifting the price of Bitcoin around, according to a report from Bloomberg. The fact that both Bitfinex and Tether Ltd. are under the same management puts them in a position of scrutiny by government authorities, especially because the majority of new USDT tokens released into the market go through Bitfinex. Although Tether CEO JL van der Velde brushes off allegations of collusion, many academics have pointed their fingers firmly at Bitfinex for using Tether to buy Bitcoin at significant moments of weakness. This isn’t the first time that US authorities have looked into the two companies, as the CFTC sent subpoenas to both of them earlier this year. Right now, sources are saying that both the DoJ and CFTC are working on the current probe. Spokespersons for all institutions involved have declined to comment. Although it seems likely that Tether was used to buy dips in the Bitcoin market, there seem to be other factors at play related to the cryptocurrency’s crash. In particular, Bitcoin Cash’s hard fork civil wars have stretched trust in the communities and networks holding coins to their limits. Wright went on Twitter last Wednesday warning anyone supporting the side of the hash war in opposition to his that he will fund his efforts to overpower the network with Bitcoin and cause a mass sell-off. “Oh. And [Jihan Wu] and [Roger Ver] selling… They will also have to sell BTC to pay rented hash. If this is a long war… Expect 2014 prices in BTC… Think what that does… Have a nice day,” he added. 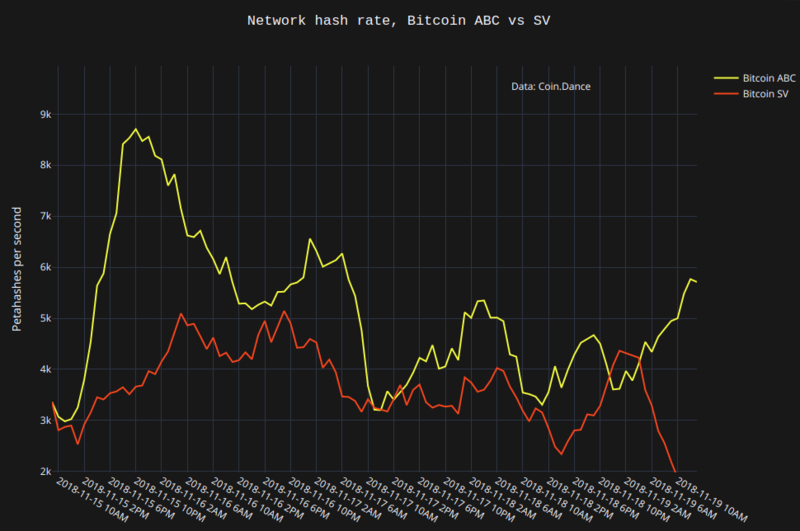 Three days after these threats, we saw SV (Wright’s version of BCH) nearly surpass ABC’s hash power. It almost looked like his network would win, raising the gap even further yesterday evening. However, the party was over as soon as the clock struck 2 AM. The majority of Bitcoin Cash’s hash power is in the hands of Bitcoin ABC and it’s difficult to see SV come back from this hit. Nonetheless, the entire dramatic debacle between the two sides left some scars in the cryptocurrency community and surely affected the confidence traders had in the market. The multi-faceted nature of the events surrounding the Bitcoin crash makes it difficult to determine exactly what caused it. The most likely solid prognosis may be, after all, that a combination of market manipulation and drama that spilled over from the BCH fork have broken the camel’s back.